Caren was raised in Ohio, the oldest of four children. Much of her childhood was spent reading every book she could get her hands on, and crafting her own stories. She was influenced by a diverse array of authors, including Rumer Godden, J.R.R. Tolkien, Ursula Le Guin, Marion Zimmer Bradley, Willa Cather, and the Brontë sisters. She has lived in Virginia for over twenty-five years where she practices physical therapy, teaches anatomy and lives with her partner and their canine fur-children. She began writing creatively again several years ago. Her first novel, Looking Through Windows, won a Debut Author award from the Golden Crown Literary Society in 2009. Since then, she has published more than a dozen novels, winning multiple Rainbow Awards and a 2014 GCLS Award for In This Small Spot. She recently branched into fantasy, publishing the Goldie and Rainbow winner, The Beast That Never Was, a retelling of Beauty and the Beast, as well as the award-winning The Dragonmage Saga. She lives in Virginia with her partner and their canine fur-children. That’s Hermione (the cute, furry one) in the photo above. 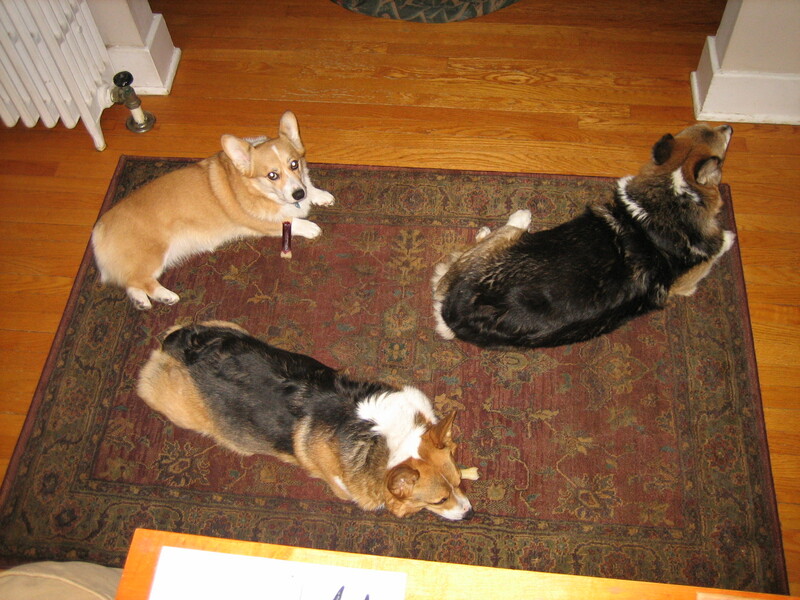 Three corgyn on a rug – the inspiration for Corgyn Publishing! Congrats on the publishing and on getting the dogs to do so much work! Your dogs are adorable! I have a pug, but four pugs would be better. You’ve got the right idea there. Thanks, Karelia. Corgyn are like Lays potato chips, you can’t have just one! Nice! I’m a Corgi admirer too. I look forward to reading some of your work. Thank you, Gabriella. We fell in love with the breed many years ago – they’re sweet dogs. I hope you enjoy the books. Hey, I also grew up (mostly) in Ohio. Always a big reader,too. Have read several of your books recently. Now I just have to go back to see where I bought them to do the reviews up right, so to speak. Thank you, Samantha! I appreciate the support. Well, now I’ve read many more and they have only served to make my first opinion LOUDER. You are one of the rare ones: a truly gifted writer. I will be looking for any I missed. You can be sure of that!! I absolutely loved “Neither Present Time”! It was amazing. My review is on goodreads. I’m very curious about one thing and I just had to contact you to ask about it. You wrote in the acknowledgments section of the book that you did indeed find an old book with the inscription described, though you’ve changed the date. Rachel, thank you so much for reading and writing. My copy of Rumer Godden’s Take Three Tenses was a reprint from 1948, inscribed in 1949. That book was originally published in March of 1945, which fit in perfectly with the timeline of my story.